Dakar 2017 has started. The 39th edition of the Dakar will be held 2-14 January 2017 and crosses three countries in South America. New to the trail is Paraguay, where the rally starts in Asunción. From there the rally leads to Bolivia and finishes for the fifth consecutive time in Buenos Aires, Argentina. 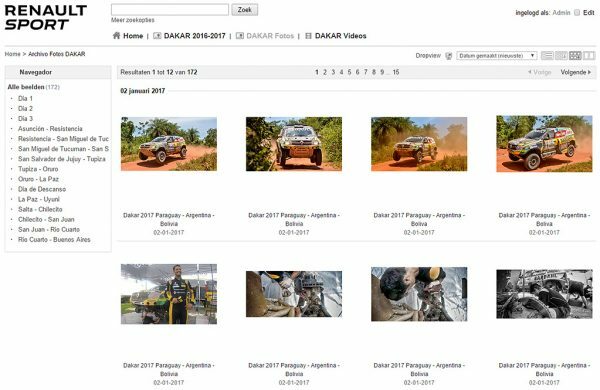 Renault Sport Argentina quickly needed an image database in which they could save the photos and videos of Dakar 2017 and easily share with the international press. Through Eurosimer Digital, our partner in Spain, MediaFiler got to realize an image bank. We received the request on Monday and four days later, on Friday, the Renault Sport archive ‘Dakar 2017’ was launched! MediaFiler image banks can be realized fast. Want to set up an archive for your event or contest? Please feel free to contact us!